Dytran Instruments have introduced more sensitive versions of their rugged ATEX rated 2006V pressure sensor series, which cover ranges from ±50 to ±500psi. The new model 2006M1 offers a full-scale measurement range of ±5psi, whilst the 2006M2 can measure up to ±16.5psi. 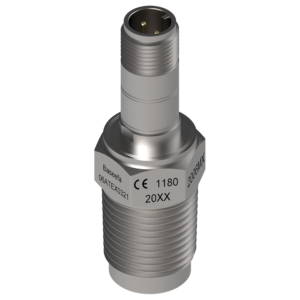 These sensors have a ¾-14 NPT mounting thread, and a rugged 5/8-24, 2-pin connector on the top for signal, power and ground. The whole sensor is internally ground isolated and hermetically sealed, and is manufactured in 300 series stainless steel, with the wetted parts being 316L. It weighs 135 grams and is 66mm long to the end of the connector. The sensors have a frequency response from 0.6 to 2500 Hz ±5% and a temperature range up to 121°C. The built-in electronics mean that they require a constant current voltage supply as the IEPE standard, and the charge converter has no voltage enhancing/generating parts. These acoustic level pressure sensors are ATEX Ex II 1G Ex ia IIC T4 Ga approved through Baseefa06ATEX0321, and these are marked on each sensor. These devices are designed for use in industrial acoustic studies, industrial pressure pulsations, pipeline leak detection, or general purpose industrial pressure measurement applications. If you have any applications, especially in hazardous environments, where dynamic pressure changes need to be measured, please let us know since we now have a good range of sensors to choose from.